Editor's Note: Welcome to CNN Radio Music Notes – your backstage pass to all things music! From intimate conversations with headliners to the latest scoop on your favorite Indie band, hang out with us to find out what's happening in the world of music. Listen to the full story in our player above, and join the conversation in our comments section below. (CNN) – Michael Kurth lives in one of Atlanta's intown neighborhoods. On his way to work, he often builds time into his drive to pass through a particular street tunnel about 10 minutes away. 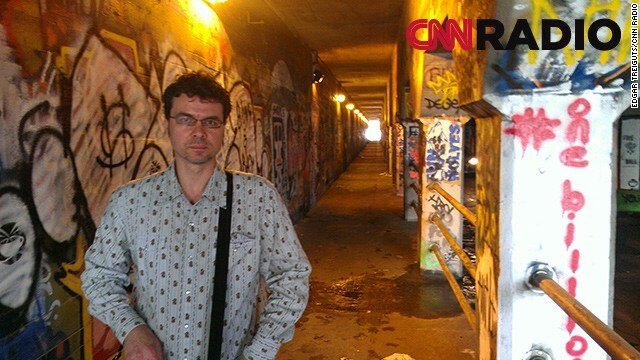 He says the graffiti-laden walls of the Krog Street tunnel on Atlanta's eastside provide entertainment. But more than that, he says the artwork reflects an energy of the neighborhood and the city. [1:06] "It's so active, it's so evolving. In almost everything you see painted there or plastered there or expressed there, you sense that these are people doing something for their community out of love." [8:35] "To me that spoke of our hope as humans, as society, as individuals that we can create something that at least makes an impact on the space that we occupy in the time that we have." Michael Kurth's ASO colleagues debuted his 12-minute symphony, "Everything Lasts Forever", last month. Kurth has composed other music, which can be heard online on Facebook at "Michael Kurth, Composer."